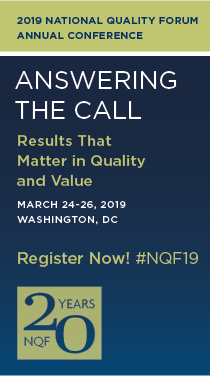 The National Quality Forum’s (NQF) Measure Applications Partnership (MAP) continues its work to help ensure quality measurement in federal healthcare programs is meaningful and minimizes burden for clinicians and other providers. In reports summarizing MAP’s most recent review of measures under consideration for clinician, hospital, and post-acute care programs, MAP provides recommendations to the Centers for Medicare & Medicaid Services (CMS) on ways to reduce the burden of measurement and promote measure alignment. MAP stresses the need to balance removing measures from federal programs while maintaining a focus on important quality and public health issues and ensuring progress among low-performing providers. In its report on considerations for measures in hospital programs, MAP suggests CMS remove measures with unintended consequences, such as encouraging unnecessary treatment or worsening access issues for vulnerable patients. MAP suggests a preference for keeping measures that are easily implemented and which can be applied across care settings, especially those that can be used for internal quality improvement efforts. MAP’s report on considerations for measures in clinician programs notes that some of the most meaningful measures may have a high measurement burden, and cautions that there may be unintended consequences if low burden measures are prioritized over more meaningful measures that are more challenging to report. MAP shares a preference for outcome measures and supports the use of composite measures that provide a comprehensive view of performance. For clinician programs, specifically, MAP highlights the need for a broad range of measures applicable to providers, their specialties, and their patients. MAP also reviewed and recommended eight episode-based cost measures for future use in the Merit-Based Incentive Payment System, pending NQF endorsement. In its report on considerations for measures in use in post-acute care and long-term care programs, MAP suggests that CMS also consider alignment of measures within and across programs in criteria for removing measures. MAP notes for example, that measures removed from one program due to a low performance gap should be considered for removal in other programs. MAP suggests that measures reporting the incidence of infections with very low incidence rates should be evaluated for their implementation cost relative to their expected benefit. MAP suggests maintaining measures with a specific application to a unique setting, such as home health. Convened in 2011, MAP is a public-private partnership that annually provides HHS with analyses and guidance in the federal rulemaking process for quality and efficiency measures used in various payment and public reporting programs. More than 150 healthcare leaders from 90 organizations who regularly use measures and measurement information participate in MAP discussions. In its 2018 guidance, MAP follows up on its 2017 guidance suggesting that CMS remove 51 measures from federal programs. MAP’s reports on setting-specific programs follow the February 2018 release of its final measure recommendations for 35 performance measures under consideration for use in federal healthcare programs.